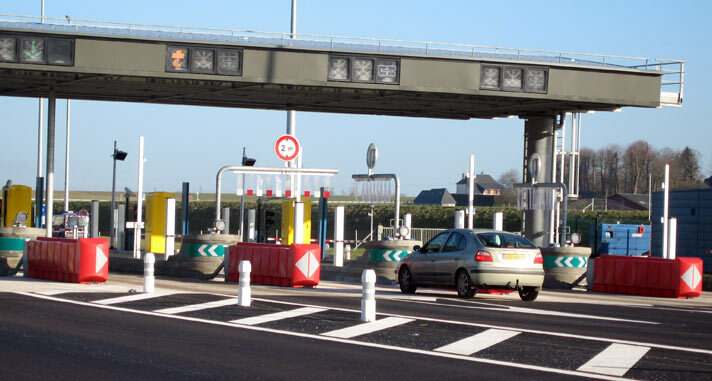 A bit late to be talking about the summer hols, but seeing as I haven’t posted in awhile I thought tales of midnight driving and weird toll systems might be amusing. The title? Oh well, it could mean I haven’t been on here for awhile but what I really meant was I haven’t been out of the country in awhile. 3 years in fact. So when big sis had this grand idea for the whole family, kids ‘n’ all, to holiday in the south of France who was I to say no? I tend to take a relaxed approach to planning a holiday, my wife calls it laziness though I beg to differ. Why take the fun and adventure out of a holiday? Nothing gives me more irritation than having to make lists and write labels. Well, maybe not as much as being proved wrong and having her give me the ‘told you so’ look. send a dodgy photocopy of the picture to a guarantor to identify. Don’t they know black people’s features don’t show up pretty good in photocopies? If you’re from the UKPA and you’re reading this I’d be more than happy to give you an extra photo next time; those three other copies always end up at the back of the drawer anyway. Though the sisters decided to fly I opted to drive with the family instead, it’s only 9 hours right? That’s like what, Lagos to Kaduna? Well the real reason was my mañana approach to booking ahead, meant there were no more affordable flights so we had to take the car. Turned out to be a brilliant decision as the views along the way were breathtaking, (and my sisters luggage went AWOL) what with the viaducts towering over small villages nesting in the hills, the mist turning landscapes into oriental style paintings and the occasional “look daddy! A cow!” coming from the back of the car. 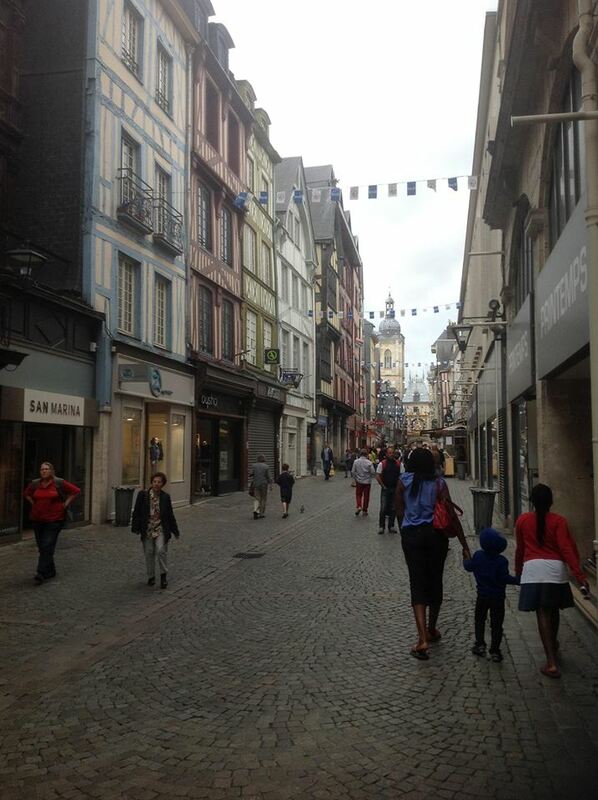 Driving meant we could afford a stopover at Rouen to break the journey and give me time to recharge my batteries. The kids? They run on solar power, as long as it’s daylight outside you can’t stop ’em. Ah yes, the microwave. for anything but breakfast. OK that aside I couldn’t understand the logic of a hotel that allows you to book on-line at one price and then charges you another when you turn up after driving for almost 3 hours with a tired family in tow. Would make sense if the site had at the very least told me that at the time of booking, or if they’d thought about it, checked my points balance before providing a quote. A whole month later I’m still waiting for a sensible reply, so far they’ve sent me an email apologising for my ‘experience’ but nothing much else. Continental style customer service. 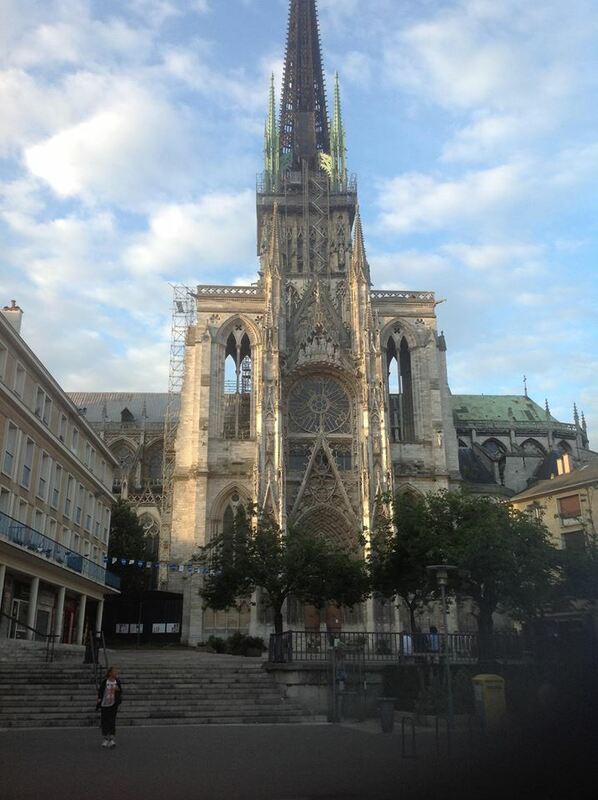 The next day we took our time before setting off on the next leg of the journey; a trip to the town centre where we took in the amazing Notre Dame Cathedral and narrow market street full of stalls selling fresh French pastries. Sterling exchanged, tank filled we continued south towards Le Mans stopping now and then to make sure we’re (OK, I was) on the right route; the car sat nav went as far as the UK and Ireland so not much help. I couldn’t understand how the tolls worked either. The first charged us 7 Euros the next almost 30 Euros! The annoying thing about the second one was I made a wrong turn and to put it right I had to go round a roundabout. Only problem was the toll gate that materialised just before the roundabout. I tell a lie, the other problem was we’d run out of euros and the damn thing wasn’t accepting our debit cards. I’d love to repeat the conversation we had but neither one of us could understand what the other was saying. All those lessons I’d received from Elodie at Benugo on conversational French came to nothing. We parted with £25 which was more than it should have been in euros and continued the journey. As if that excitement wasn’t enough, we were 34 miles away from Le Pas Opton, our destination, with only 30 miles of fuel left in the tank and no fuel station between the two. That bit of information I thought I’d keep to myself as I could tell my wife was getting really nervous. 34 miles later we arrived at the resort so I went to pick up the keys and was meant to follow one of the coordinators on a bicycle to our living quarters. However, when got back to the car surprise, surprise, the car wouldn’t start. Wouldn’t even turn over. There wasn’t a cloud in the sky though. That’s good, right? Next episode: Ice-cream, near drowning and smelly cheese.